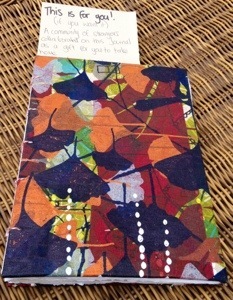 Journal 17′s Finder blogged about the experience! This is so lovely. Journal 17′s Finders are Catherine and Paul. Catherine has been following along on the Facebook page so knew what to look out for, and when they found one, Paul wrote about the experience on his reviewing blog. Arrived at the Arts Centre car park at bit early for our pre-Einstein Dafternoon Tea (dinner served at afternoon tea time). Catherine began pestering me about some journal thing while we were walking towards Hamer Hall to have a look at Hidden Space, Ready Stages, an installation in the Riverwalk space. She was not explaining herself clearly. I thought she was talking about a new Arts publication. I was forced to look up @sharing_ink on Twitter (she’s old skool and doesn’t have a smart phone). I’m glad I did because the pic of Journal #17 had just been posted and we recognised the background of the photo as a cane table just like the one we were standing next to. There it was, just a few tables away. We bought a biscuit and fed some crumbs to the expectant sparrows while admiring the find. My annoyance at Catherine’s whims instantly evaporated. What a beautiful thing! Beneficiaries of guerrilla kindness. Thank you Sayraphim Lothian.